This allowed Bolzano to accept the mystical elements of Christianity for the greater good of mankind, although he did not accept them to be historically true. Chairs in the universities were filled by competition and Bolzano entered two such competitions for chairs at the Charles University. One was for the chair of mathematics which became vacant on the death of Stanisław Vydra, the other being for the new chair in the philosophy of religion which Emperor Franz had just established. Bolzano came top in both competitions, but the university preferred to give him the chair in the philosophy of religion since they were then able to give the mathematics chair to Ladislaw Jandera who had substituted for Vydra during his illness between 1801 and 1804. In many ways Bolzano was exactly the wrong person to fill this chair given the reasons for its creation, for he stood for all the ideas which Franz feared, being a free thinker who believed in social justice, pacifism, and equality for the Czech speaking Bohemians. The appointment of Bolzano was viewed with suspicion by the Austrian rulers in Vienna. He criticised discrimination wherever he saw it, principally by the German speaking Bohemians against their Czech fellow citizens, and also he criticised the anti-Semitism displayed by both the German and Czech Bohemians. Some members of the Roman Catholic Church were also unhappy because Bolzano's lectures contains elements of rationalism. He certainly had supporters within the Church, for example the important Archbishop of Prague and Dr Fessl who directed the seminary of Leitmeritz. In 1815 Bolzano was elected to the Royal Bohemian Society of Sciences which was bilingual society drawing its members mainly from the German speakers but also from Czech speakers. Bolzano published On the Condition of the Two Nationalities in Bohemia in 1816 in which he put into print his concerns that the Czech Bohemians were dominated by the German speaking Bohemians. The peasants were Czech speaking, the cities largely inhabited by German speakers but Bolzano saw the problems which were being created due to increasing industrialisation which saw Czech speakers moving into the cities. Bolzano's career continued to flourish, despite the fact that charges were brought against him at the Vienna court in 1816, and in 1818 he was elected Dean of the Faculty of Philosophy at Charles University. The paper gives a proof of the intermediate value theorem with Bolzano's new approach and in the work he defined what is now called a Cauchy sequence. The concept appears in Cauchy's work four years later but it is unlikely that Cauchy had read Bolzano's work. 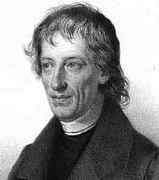 After 1817, Bolzano published no further mathematical works for many years. However, in 1837, he published Wissenschaftslehre Ⓣ , an attempt at a complete theory of science and knowledge. Between sometime before 1830 and the 1840s, Bolzano worked on a major work Grössenlehre Ⓣ. This attempted to put the whole of mathematics on a logical foundation was published in parts, while Bolzano hoped that his students would finish and publish the complete work. His work on paradoxes Paradoxien des Unendlichen Ⓣ, a study of paradoxes of the infinite, was published in 1851, three years after his death, by one of his students. The word set appears here for the first time. In this work Bolzano gives examples of 1-1 correspondences between the elements of an infinite set and the elements of a proper subset. Most of Bolzano's works remained in manuscript and did not become noticed and therefore did not influence the development of the subject. Many of his works were not published until 1862 or later. Bolzano's theories of mathematical infinity anticipated Georg Cantor's theory of infinite sets. It is also remarkable that he gave an example of a function which is nowhere differentiable yet everywhere continuous. Attempts to publish Bolzano's manuscripts are described in our article Bernard Bolzano's manuscripts. Bolzano opens this notebook of Miscellanea mathematica with notes on irrational and transcendental numbers and functions. But he was reading and recording his ideas on a host of other subjects as well, including the problem of how best to approach the proper mathematical understanding of zero; Legendre's work on surfaces, convexity, concavity, and conditions for congruity; analysis of other geometric concepts, including lengths, areas, volumes, and spheres; trigonometric formulas and spherical trigonometry; imaginary and exponential numbers; definition of the differential and discussion of the infinite and various opinions about it, as well as aspects of maxima and minima. ... Other topics covered here include various approaches to the calculus (including the method of exhaustion), and grounds for asserting the certainty of mathematics.